The church was built during the foundation work of Sabaudia and formally inaugurated on 24 February 1935. At 22 meters high, 55 meters long and 29 meters wide, it has an arcaded façade covered with blocks and slabs in two stone travertine, the outer sides are faced with red bricks. The imposing mosaic depicts the Annunciation together with the representation of customary life and ambience during the reclamation. It has one only aisle sided with 6 semicircular chapels, and two symmetrical pulpits next to the high altar, central to the presbytery. 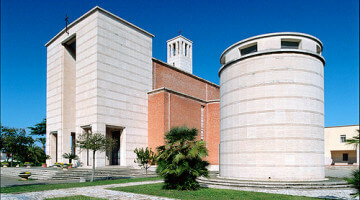 The cylindrical Baptistery stands on the forecourt to the right of the church; the lofty Belfry, 45 meters high, is on its left.